What Need Does My Brand Fulfill? What Channels Do My Customers Use? Ecommerce marketing is when you implement strategies to promote and raise awareness around your online store and brand through digital channels. There will be an estimated $3.45 trillion in ecommerce sales in 2019, and PipeCandy estimates between 2 and 3 million ecommerce stores worldwide (excluding China). The ecommerce market is nothing but colossal, and it’s heavily saturated. In order to get a piece of that pie, you have to think about drawing in as many customers as possible, and you have to get creative. We live in an omnichannel world, where customers pass through several touchpoints of contact with your brand before they purchase. Think about it, in the online world, a customer can’t just drive by and notice your online store. They can’t just pop in and check it out on a whim. You have to do something active to bring your customers in. With ecommerce marketing, you can use several different channels to reach your customers where they are all the time. There are a variety of ways you can market your online store, and most of these strategies are inter-connected. In this post I’m going to dive into different strategies you can use in conjunction with one-another to create a 360 degree ecommerce marketing strategy. Before we jump in, I want to make one thing abundantly clear. You can’t do everything. Nor should you. 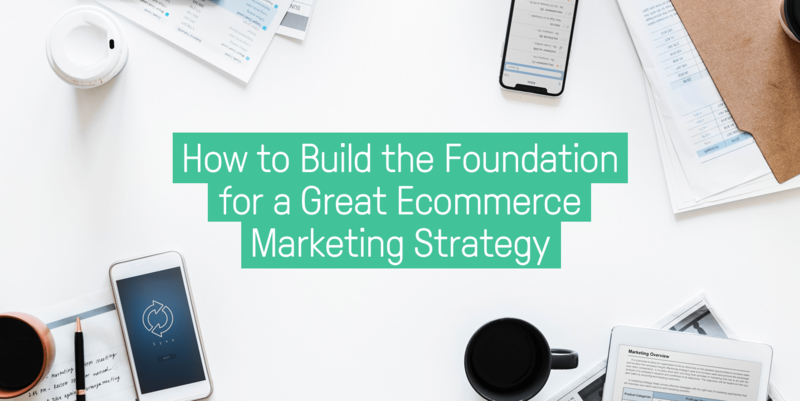 If you’re just starting off with ecommerce marketing, it’s important to first build a solid foundation and then build on to that bit by bit. Otherwise, if your central strategy isn’t rock-solid, everything will crumble around you in time. What need do I fulfill? What channels do I need to use to reach my customers? There are obviously a lot more details to think about, but your customer should be at the heart of your marketing strategy. Centering everything you create and communicate should be centered around who your customer is, what they need, and where they are. When you start off creating a great ecommerce marketing strategy, you have to put a face and a name to your customer. But you’re not going to go out and snap a photo of your customer. You want to create a figurehead that represents your customer. Use the data you have around your market and your customer and write up a quick persona on who that customer is. 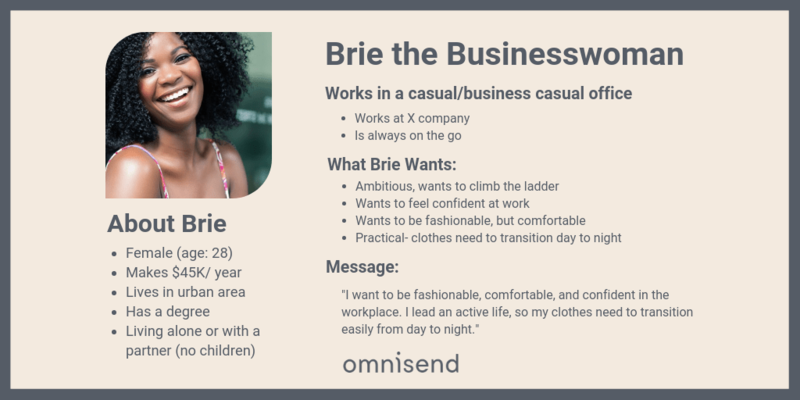 The idea behind creating a marketing persona like this is to keep Brie in mind when you’re creating content or writing social messages. What is she going to want to hear? How should your tone reflect your brand in such a way that it speaks to her? How does she speak and how can you mimic that to resonate better with her? Creating a persona like this will help you write an ultra personalized message that’s going to be relevant to your customer. You can even write as if you are having a conversation with her. Keep this marketing persona at the forefront of your strategy, it’s going to help you as we dive into more complex subjects. What Need/Want Do I Fulfill for My Customer? Now that you know who your customer is, you can determine how your brand and your products fulfill their wants and needs. For example, I’ve created Brie for an online fashion merchant. As part of this ecommerce marketing strategy, I would then respond to how these clothes respond to Brie’s needs. For example, Brie needs to be able to transition from day to night easily. So I would respond that our brand has many easily transitional pieces that work well in the office or for after-work drinks. Think about what your customers need and how you respond to that need. Now you have the entire basis for your content marketing strategy. We’ll get into that in just a moment. This part might take a bit more research. It’s important to decide which channels you’ll use to reach out to your customers. However, you can’t just pick a channel you think might be cool and gun it. Where do your customers spend their time? Are they most likely to find you through search? Are they predominantly Facebook or Instagram users? Do they value video content or tutorials or both? These are questions you can respond to by looking at your competitor. We’ve already established that the ecommerce market is saturated- so look at your closest competitors and figure out what they’re doing on each of their channels. Don’t stop at a simple glance at their site. Sign up for their emails, follow them on social media, and make a purchase or two. It’s the best way to see how your own business will measure up. Depending on which channels your customers use, you’ll want to employ different tactics. As I mentioned before, many of these strategies work in conjunction with one another, which means you would start with one and follow up with the next, and so on. What you want to do is create a foundation and then build from there. Content marketing is one strategy you can’t neglect when you’re selling online. Everything that you put on your store is content, from your product copy to sales banners to product photos. All of this content can be used, reused, and adapted to send messages to your customers. So how do you create content around your brand? Start from your product and the need you fulfill for your customers and work outwards from there. Remember how I mentioned that you would be referring back to your customer persona? When you create your content, create it with that person in mind. Your content always needs to be linked back to your business in some way. For example, if you’re selling women’s fashion apparel, you wouldn’t necessarily go into a blog post about going vegan unless that was part of your brand image. Otherwise, it won’t resonate with your target customer. I mentioned earlier about how we had products that transitioned from day to night for Brie. 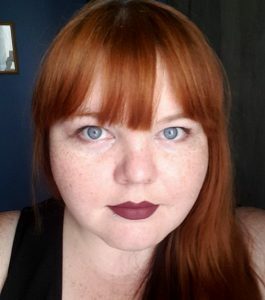 An example of great content would be a tutorial on how to transform classic pieces in your wardrobe from day to night with accessories in a listicle. How does it sell? Elementary, my dear Watson. Simply put a link to where a customer can find the classic pieces and each accessory that you would be selling along with it. Call your customers to shop the “Classics collection” at the end of the article. Give your customers the next step- otherwise they won’t know where to go. Creating great content can be time consuming, but it’s ultimately worth it. Because you know who loves sites that update with fresh content regularly? Google. Search Engine Optimization, or SEO, is another thing you have to be thinking about when creating content for your site, because your customers can’t appreciate your awesome content if they can’t find it. SEO is the practice of optimizing content to be easily findable on search engines and ranking for keywords that are relevant to your brand and products. So how do you make it findable? First, you need to make sure your website is technically sound. Google, or other search engines, will have a hard time ranking you on the first page of the search results if they can’t find or interpret your content. An SEO audit took like WooRank can do a deep dive into your ecommerce site’s product pages to ensure everything is technically correct. 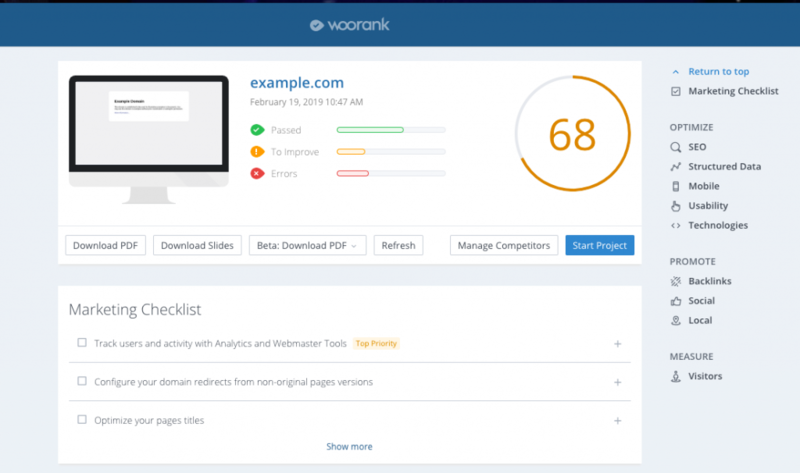 The tool will check for duplicate content, broken links, crawl errors and more. Best of all, WooRank gives you actionable advice on how to solve these issues if you aren’t familiar with technical SEO. As a bonus, the tool allows you to track your performance over time so you know if your site is improving. Find out what your customers are searching for– this is basic keyword research. Let’s go back to Brie- what is she looking for? How would she search for something? 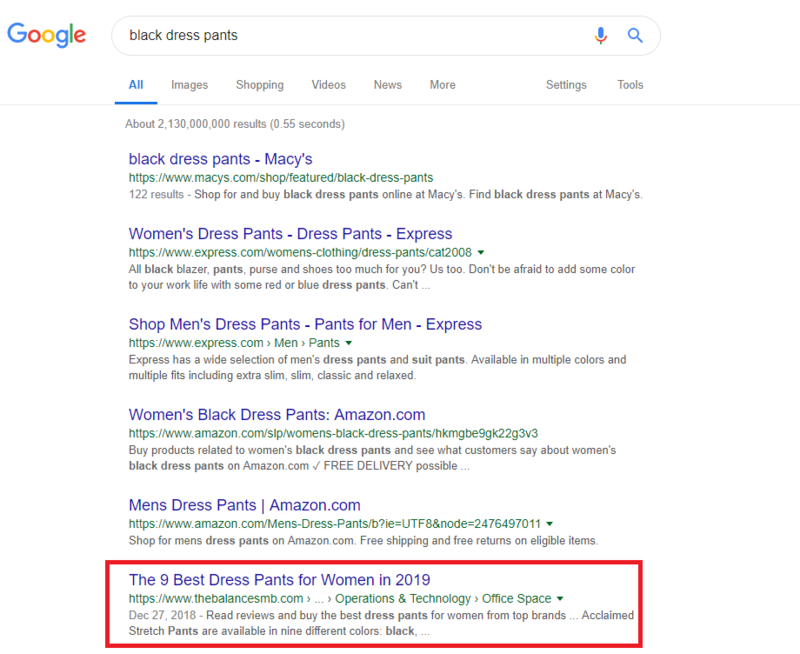 Granted, “black dress pants” isn’t exactly a precise search, but this is a typical launching point for a customer who’s doing product research. Notice how we have a lot of shopping links, but we’ve got an article that ranks the best dress pants for women in 2019. This is a great example of content marketing. What’s particularly interesting here, is that you can scroll down to the bottom of Google’s front page to see similar searches other customers have made. This will give you more ideas on what your customers are looking for. You can also use Google’s autocomplete for this. But you don’t have to stop there. Moz has some pretty nifty free SEO tools you can use when you’re starting out to help with your keyword research. 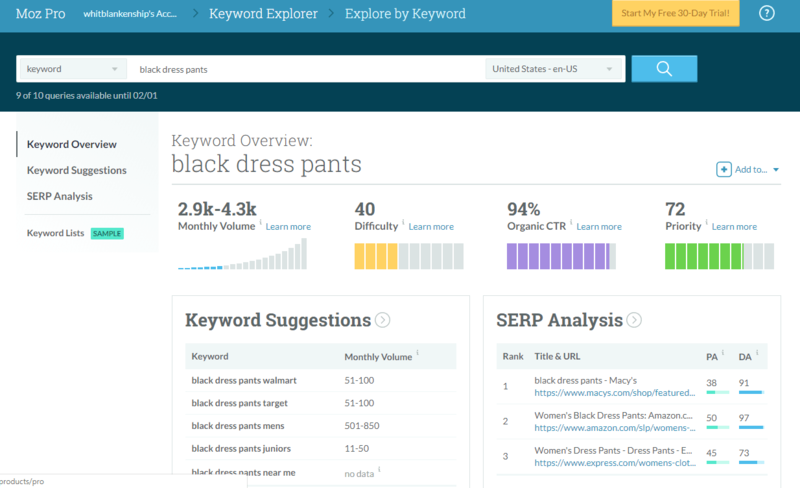 This simple dashboard would show you how each keyword ranks and whether it might be too difficult to try to rank for. What you want is the Goldilocks sweet spot between high volume and low difficulty. If the search volume is too high, chances are, you already have a saturated market of competitors vying for that top spot. If Moz isn’t your thing, you can also try out SEMRush which works really well for this kind of research too. Regardless of what tool you use, you want to build a list of keywords to rank for and then create content around those keywords. Remember that SEO is not an instant thing. It takes time, so be patient. There’s plenty for you to do in the meantime while Google is crawling your content. If there are three areas in ecommerce marketing to focus on first, it’s content, SEO, and email marketing. These three areas build a true foundation for your marketing operations. Email marketing is when you send email messages out to subscribers and customers who have given you permission to do so. While these aren’t all of the ways we can use email for ecommerce marketing, they’re the most typical and standardized methods that your customers are likely to expect. For more information on building an awesome email list, check out our post here! Once you put your email capture methods in place, you should start by automating a few different emails. When a subscriber joins your email list, it’s a good idea to send a killer welcome email to let the customer know that their subscription was successful, what they can expect from you, what the next step is, and if you’ve incentivized sign up, their incentive. But it would be time consuming to manually send an email like that to each and every person that signed up right? So you automate this using an email marketing tool. 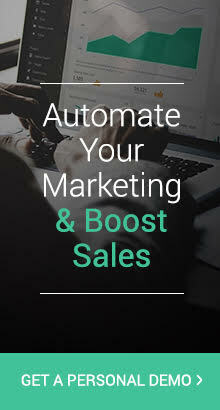 You can also start off by automating things like abandoned cart emails, order confirmation, and shipping notifications. These emails are crucial for your customer, but shouldn’t take away from your core business. Once you have basic automation set up, you can begin segmenting your subscriber lists and personalizing your content. Email marketing is the most powerful channel you can use to reach your customers. Unlike search and social, for example, these leads are already warm. These are already people you know are interested in your products, brand, and offer. And when you market to them effectively, you’ll see sales like you never thought possible. This is far from an exhaustive article on how to build an ecommerce marketing strategy, but it should at least point you in the right direction. By first focusing on who your ideal customer is and what need of theirs you fulfill, you’ll be able to craft content that feels like it was made for them. When you focus on your customers’ needs, you’ll be better able to write content based on keywords that they’re actually looking for. And finally, when your customer does find you through the amazing, SEO-rich content you’ve made, you’ll be able to effectively capture their email address and build a customer base from the ground up. From this initial point, branching out into social media, referral, and influencer marketing will be no sweat. After all, you’ve already built an amazing ecommerce marketing foundation to support it. What are your best ecommerce marketing tips? Do you think these are the most important things to focus on from the beginning? Tell us below! Great in-depth article! Thanks for sharing. In fact I think this single article has loads of useful information about e-Commerce. Marketers should not neglect their SEO marketing, having your website on the top pages translates to more exposure for your website that leads to more sales. Thanks to premium digital marketing information for unbelievable price for free. SEO is a huge part of ecommerce, kind of like the sign on the front of a brick-and-mortar store, it’s THE way customers find you. I couldn’t agree more.